Kirk Purdom assumed the role of executive director of Alumni Affairs on March 14, 2016. He is responsible for coordinating alumni activities for the university’s 125,000 alumni and the Alumni Association’s 70 Ole Miss clubs throughout the country. He also oversees The Inn at Ole Miss, Oxford’s largest hotel. A 1993 UM graduate, Kirk played baseball for the Rebels and worked for several departments on campus from 1994 to 2001, including two years with the Alumni Association. His wife, Keilly, also played golf for the Rebels and served as head women’s golf coach from 1991 to 2001. 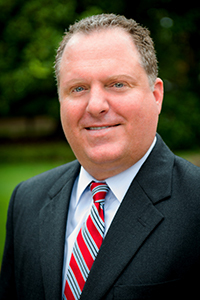 Prior to returning to Ole Miss, Kirk served as vice president for advancement at Transylvania University. He came to Transylvania University in 2011 from Kentucky Wesleyan College, where he was vice president for advancement. The Purdoms’ oldest daughter, Kie, is following in her parents’ footsteps at Ole Miss and is on the Ole Miss golf team. Kirk and Keilly also have two younger daughters: Kara Beth and Kate.